Maintaining a high standard of product quality is of the utmost importance. 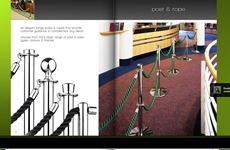 It is for this reason Atir Design sources the highest standard of barrier ropes. A large colour range ensures that every need can be met. ATIR Design, Suppliers of Tensabarrier in Australia, enjoys the outstanding reputation of being at the forefront of the supply of quality portable Tensabarrier and queuing systems along with many other products for the Hospitality and health and safety Industries. Please feel free to browse through our product range to discover more about ATIR Design and our innovative products. Tensabarrier by Atir Design, Why settle for anything less than the best.